KISS frontman Paul Stanley sat with WSJ's Lee Hawkins for an exclusive interview about his life and career. In this clip, Stanley shares the origin of the famous KISS makeup. 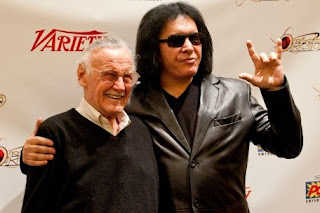 Last week, Gene Simmons of KISS hosted a Live Q&A with comic book Legend Stan Lee via Ortsbo.com, a real-time experiential language translation platform, at the Sundance Film Festival in Park City, Utah. The two pop culture icons were there in part to promote 'With Great Power: The Stan Lee Story,' a documentary celebrating the icon's influential career in the comic book and cinema worlds. Simmons was also at the famed festival to help spread the word about the Ortsbo app. It's a fitting union since the KISS icon speaks four languages, including English, Hebrew, Hungarian and German, plus some Japanese, and is currently working to add Mandarin to his repertoire. Ortsbo enables real-time conversational translation in over 50 languages and seamlessly integrates with today's most popular social media platforms. After the press conference, Simmons spoke exclusively with Noisecreep about his admiration for Lee. Can you describe how Stan Lee has influenced you over the years? I started reading Marvel Comics in my youth, like many millions of young boys. For me, Stan Lee's stories had a profound, empowering quality that continues to this day. I witnessed super heroes with flaws. With self-esteem issues. With doubts about themselves. I was so awed by the stories and the mythology of Stan's super heroes, that I wrote him a long letter, comparing Marvel's heroes to Greek Mythology and their gods. And Stan Lee wrote back a postcard. I remember it, as if it happened yesterday. "You will do great things", he said. And he signed it Stan Lee. I felt as if I was touched by the very Gods of Olympus at that moment. And that feeling as never left me. Excelsior. Can you imagine ever working the Ortsbo technology into a live concert setting like you did today? Ortsbo.com has taken off like a rocket. It's uses, both for humanity's sake and for commerce, in general, is going to hit the world by storm. For live chats. For social media. For our military. For politics. For religion. For education... and yes, even for the live concert setting -- taking song requests in any language, in real time. Today in KISStory - January 31, 2001: Eric Singer rejoins KISS replacing Peter Criss in Cat makeup. He performs on the Japan and Australian leg of the Farewell World Tour. Singer was asked to rejoin Kiss in 2001 after Criss' departure shortly before the Australian and Japanese leg of Kiss' Farewell tour. Singer debuted in full "Catman" make-up and costume for the first time on the tour, causing some animosity because the "Catman" character had previously been solely portrayed by Criss, including during many of the band's successful years; even when Eric Carr replaced Criss, Carr did not don the makeup (he portrayed the "Fox" until Kiss dispensed with the makeup in 1983). Singer was replaced again by Criss in 2003 but returned to the band by the end of the year after Gene Simmons and Paul Stanley opted not to renew Criss' contract. Since then Singer has been playing drums in Kiss as their permanent drummer. In 2009, Singer, along with lead guitarist Tommy Thayer, played and sang on the new Kiss album Sonic Boom, the first studio album to feature the new line-up. KISS announced on their website: "Eric has been a member of our family, and his drumming and singing have been the cornerstone of past KISS tours. We are stoked that we can bring our ultimate spectacle to KISS fans worldwide." The Original KISS line-up play "Rock And Roll All Nite" at Super Bowl XXXIII. On Sunday, KISS® by Monster Mini Golf® held the "KISS® OFF" band finale with KISS' own, Tommy Thayer as the celebrity judge. More than 200 bands worldwide submitted entries for the competition. They were dwindled down to the final four groups based on talent, performance, appearance and showmanship. The final four includes KISS Forever from Hungary, Mr. Speed from Ohio, Rock and Roll Over from Texas, and KISSTERIA from Australia. They performed at Body English in the Hard Rock Hotel & Casino. Mr. Speed is the KISS OFF contest overall winner. That tribute band will make their grand debut at the opening of KISS® by Monster Mini Golf® on March 15.